In recent months I’ve really been trying to pay a lot more attention to what I put into my body and how it responds. Last year, after quite a long period of trying to figure out why I was getting stomach pains, I had my gall bladder removed. It’s a pretty minor operation and very common, but since it was really the first time in my life I’d ever experienced any proper medical issues, it was the first time in my life that I really became aware of how food made me feel. Having lived with a dull background pain for so long, after surgery when the pain was gone, I became a lot more aware of the differences in how my gut felt digesting different foods. One thing I really noticed that had a big, almost instantaneous effect on me was eating carb heavy meals. I was noticing that if I had a sandwich for lunch or a bowl of pasta for dinner, afterwards I would feel really sluggish, bloated and lethargic to the point I’d struggle to stay awake. I’m a huge pasta lover and I’m a believer in balance, not in restriction, so I’ve not suddenly gone totally carb free. However, I certainly do eat a lot less of them. It would be easy to grab a slice or two of toast in the morning, sandwich at lunchtime and pasta, rice or potatoes at dinner time and not really think about it as they’re all pretty ordinary meals, but for me this doesn’t really work any more. Nowadays I particularly try to avoid carb based meals at lunchtime. Trying to work through a mid afternoon slump is not something I enjoy. Salads are my new lunchtime thing, but I find they can get very boring as I invariably end up reverting back to the same old ingredients. Adding fruits to my salad is something I’ve been experimenting with and I have to admit, I’m not always sold, strawberries in salad seems to be quite trendy but I’m not won over. 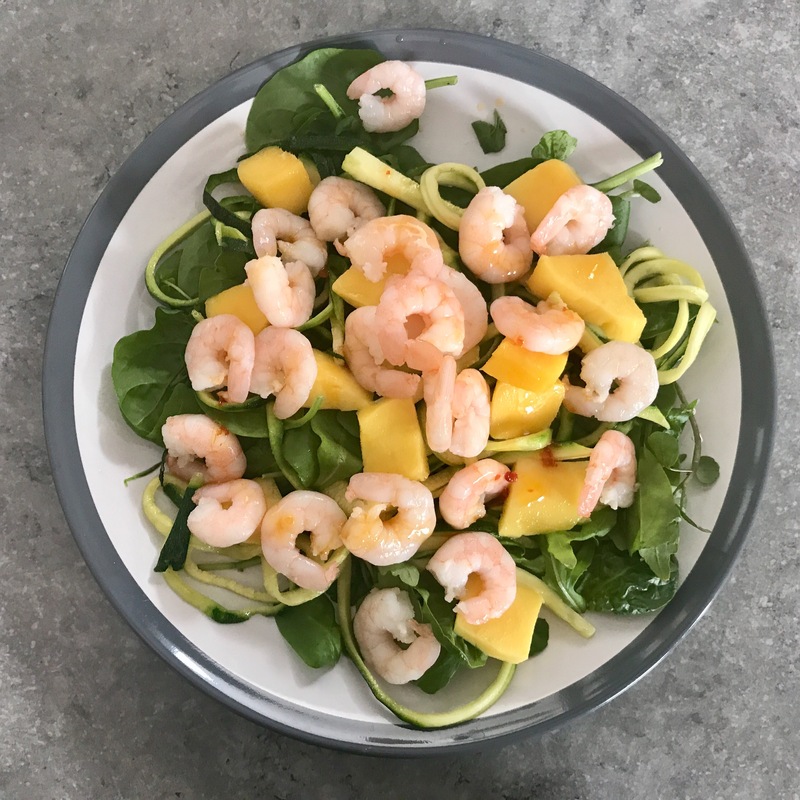 This mango salad however is something I found really refreshing, particularly when paired with the sweet chilli dressing as it cuts through the sweetness. I find ready cooked prawns a really easy ingredient to throw in with this but if seafood isn’t your thing the flavours would work equally as well with some cooked chicken thrown in as a substitute. 1. Heat the coconut oil in a saucepan on a medium heat. Gently fry the courgette noodles until softened. 2. Mix all of the ingredients for the dressing, whisking thoroughly. 3. Split the salad leaves between two plates and top with the cooked courgette noodles. 4. Scatter over the chopped mango and cooked prawns and drizzle over the dressing.